An excellent way to eat locally and support farms, as well as get outdoors on a gorgeous autumn day, is by spending the day picking apples. Take a trip to your local farm or orchard to grab all of your favorites. These farms have made a habit of providing fresh apples to their communities year in and year out. Some allow visitors to pick apples from the trees, while others let you pick from amazing baskets filled with them at farm stands. Here are the best apple orchards in New Mexico! In springtime, the blossoming apple trees at this small family farm are beautiful and fragrant. In fall, the apples, the result of those lovely blossoms, are beautiful and delicious! In business since 1943, the Cadwallader Family knows the u-pick business and make it user-friendly. Wear comfy shoes as you traipse through the orchard to pick either a pound or, if you’re up to the challenge, 20 or 40 pounds for a reasonable price. Cash or checks only, no credit cards. The main purpose of the wide-range of apple tree orchards here is to keep the bees at this large honey farm happy. There are Blushing Golden, Roam Beauty, Stark Crimson, Stayman Winesap, Granny Smith, Ultra Macintosh and the unique Arkansas Blacks in late October. The bees keep the trees pollinated, which results in some great fruit, and the apple blossoms make for some really sweet honey. All-in-all, this family operated farm is keeping nature in balance. In the 1700s, the Spanish arrived in this area of the state and brought with them apple trees. That is how the nearby town of Manzano, which means apple in Spanish, got its name. For more than 45 years, this apple ranch has kept that apple heritage alive, producing more than 4,000 bushels of apples. Open from mid-September through mid-November, you’ll find many different varieties to choose from, making this the State’s largest selection. You can’t pick them from the trees, but you can hand pick them from the overflowing bushel baskets on-hand. Four-hundred trees … how about them apples! Between August and September, they’re yours for the picking, too at this old-fashioned farm. Orchard-ripened apples are sweeter and juicier, better for eating and cooking with. 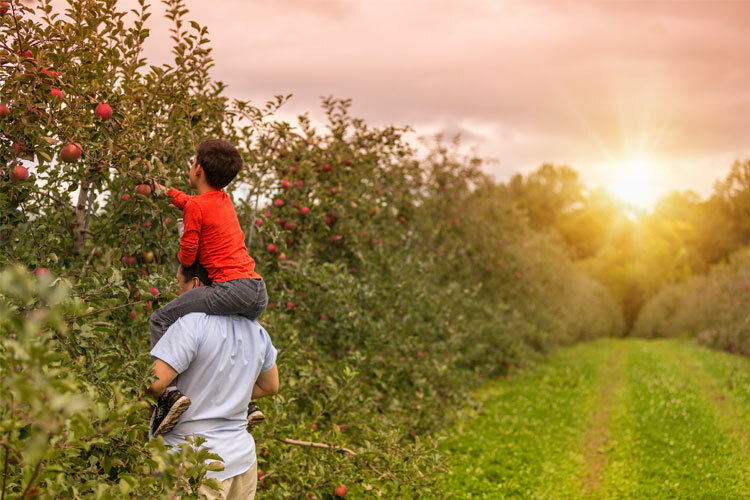 Take the family for a hunt for the best and brightest apples in the orchard. Red Delicious and Jonathans available in season. Don’t leave without picking up a home-made apple pie. On the slopes of the local Sacramento Mountains lies this beautiful ranch, with 16 acres of apple trees, some of which were planted by one of the first homesteaders in the early 1900s. It’s a good thing apple trees are long-lived, about 100 years on average. This farm has Honeycrisp, Stayman Winesap, New Mexico Red Delicious, Yellow and Golden Delicious, Fuji, Gala, Black Twig and Jonathans. Depending on weather, some or all will be available for picking. An apple a day keeps the doctor away, so the saying goes. Just imagine how you’d feel if you bought a bushel of fresh, locally-grown apples? In the pink … Pink Beauty that is. The family has been successfully farming the land here since 1879. You can’t pick apples from the trees, but you can hand select the best of the harvest at the small on-site store. Open Saturdays and Sundays only when apples are available. Call ahead. View more New MexicoApple Orchards.